Although economists are still learning about the demand function for cryptocurrencies, there is a reason why the debate can get heated. The crypto-debate is not really about innovation, technology, finance or money. Instead, it’s about people, networks, and trust. In the age of digital information and social networks, prices hardly match the unit cost of production. Digital products typically require substantial costs in research and development, but marginal costs to service one additional client are often zero. 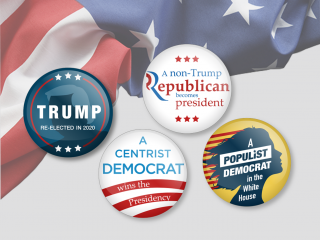 Consequently, the cost of servicing only a few customers is high but as the number of users reaches a ‘critical mass’ costs spread out, and the product is then driven by what is called the 'bandwagon effect' of positive feedback-loop from the customer base. Let’s now apply this concept to bitcoin for example. 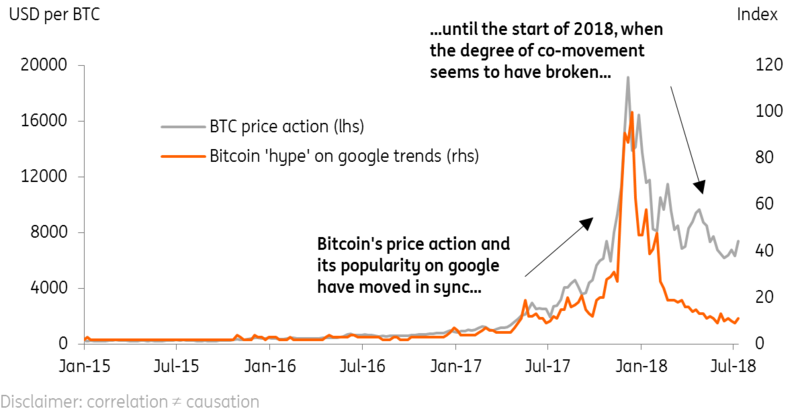 If we take a closer look at its price action, we see a strong co-movement with its popularity on Google Trends since its inception. ING, Macrobond, Google Trends. Region: Worldwide. Even though we don’t know if the ‘hype’ was driving the price or the price was driving the ‘hype’, the relationship is quite telling - although it does seem to have broken down more recently. Equally, the same dynamics seem to apply if we zoom into a typical emerging market like Nigeria. The country has experienced one of the strongest 'bitcoin hype’ waves since the inception, only surpassed by South Africa. Textbook economics suggests this isn't surprising. 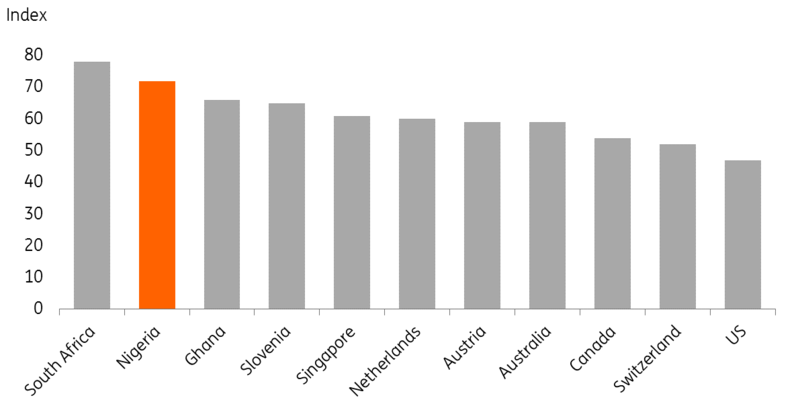 Countries which have less efficient payments systems, less liquid currencies and more volatile exchange rates are in theory more likely to see a surge in demand for alternative payments system. This also resonates with our ING International survey, where around half of the people surveyed in Turkey and Romania consider digital currencies such as bitcoin to be the future of online spending. It should be even less surprising in an environment where headline inflation runs above 10% while food price inflation – which accounts for more than 50% of the headline basket – has been above 19% year on year, according to the IMF. 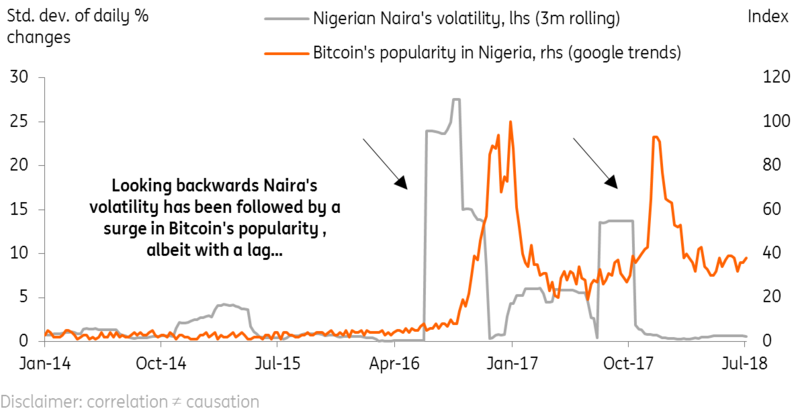 Furthermore, the ‘bitcoin hype’ seemed to have moved in sync with the volatility of the Nigerian Naira: when the volatility of the currency went up, the ‘bitcoin hype’ also went up - albeit with a lag of a few months. ING estimates on Macrobond's data. Google Trends. 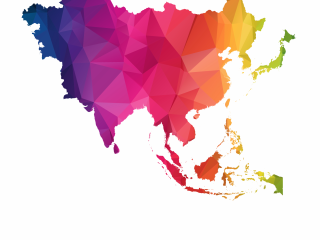 Therefore, we think that in a typical emerging market environment, the cryptocurrencies’ hype might reflect the demand to diversify risks posed by double-digit inflation and FX volatility. Ultimately, it's worth noting that according to the Financial Stability Board crypto-assets don't pose risks to global financial stability as their combined market value remains less than one percent of global GDP, at least as of March 2018. For this reason, we don’t think the link between bitcoin's hype and the FX markets is as strong as the data might suggest. Having said this, we think that applying the mechanics of network analysis to gauge the demand of cryptocurrencies is a good place to start.